The Calliope River Historical Village Markets are run by the Port Curtis Historical Society Inc. This is a “not for profit” organisation, which is staffed entirely by Volunteers. All profits raised go towards the Village running cost and maintaining the local history for our future generations. The markets are manned by voluntary workers and each market day sees a band of these people doing the many tasks that are required. The PCHSI welcomes anyone who wishes to become a member and assist as a Volunteer. The small admission charge on entry to the markets goes towards restoration and displays. The Masonic Lodge sets up in the hay-shed and has a hearty breakfast prepared for interested clientele. The PCHSI have a permanent kiosk in the Yarwun Railway Station at the entrance of the village. On market days they also have a tearoom at the back of the Clyde Hotel. The Rotary Club, Port Curtis is in charge of the popular hamburgers stall in the Rotary shed and in the same shed is the Calliope Scouts, who run the soft drink stall. The Clyde Hotel opens for business from 10 am on market days and an ATM machine can be found at the kiosk. Make the markets a family day as there is plenty of entertainment for the youngsters. With much food available, they can picnic in this charming setting under the shady trees. The Village Volunteers are now putting on some entertainment for the children in the form of Tug of War, Throwing the Thong and Sack Race competitions. The MELSA train operates for the public on Market days and can be found at the Ambrose Station. There is always a huge demand for rides from the children but it is not only the young that take pleasure in this exciting experience. The Jumping Castle is always popular with the young people and there is always a Face Painting stand on hand. While the stalls sell many different types of things, old and new, there are many who cater for culinary tastes. There is the German Sausage, the Artisan Bread and Bakery and “everything” Deep Fried stalls. Also the Coffee Van and the freshly squeezed Lemonade stand, as well as the assorted milk drink and ice cream booths. Put Dutch Mini Pancakes on the menu too and they can be found at the Poffertjes House. While circulating the markets many people can be seen bopping along to the music and the singing of the Paton’s Band. Wayne, Lyn and (son) Woody keep the clientele in a party mood while at the other end of the stalls, Skye, the female busker, distributes her type of music. While at the markets, why not check out the Calliope River Queensland Rail Museum, which is open for viewing. This display covers all the local railway stations and much on the Many Peaks line in 1910 and the extension to Monto, which started in 1922. 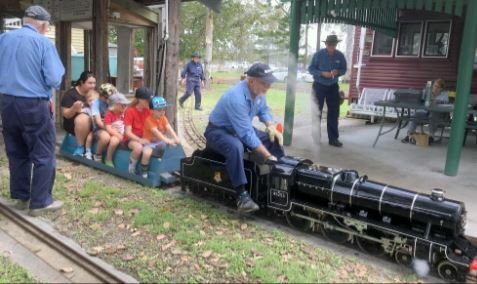 This museum is also the home of the Gladstone District Model Railway Group and on market days there is usually someone demonstrating these model trains.